Musicians have expressed their dismay that a music venue in Oxford could close. The Cellar is under threat because its landlord, St Michael's and All Saints' Charities, has submitted an application to redevelop it. The organisation said doing so could increase the amount it donates to good causes. But Oxford bands, including Foals and Glass Animals, believe it would be a loss to the city's music scene. Thousands of people have already signed a petition to keep the venue open. Previously known as The Corn Dolly and The Dolly, The Cellar has been run by the Hopkins family since the 1980s. In a statement, the venue said it was in the process of consulting a solicitor. Several prominent figures have urged music lovers to sign the petition, including DJ and music festival impresario Rob da Bank. He tweeted that he was "gutted" the "legendary independent venue" could close. 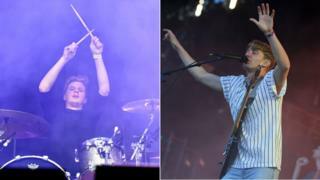 Dave Bayley, from the Mercury-shortlisted Glass Animals, said: "My love for live music, clubbing, and nightlife came from basically living in The Cellar. "I spent about three nights a week there growing up. It was one of those places you go to even if you don't know the band or the DJ... it gave bands like that a chance to practise in front of an audience, and eventually gave us that same opportunity. "It's inspired and given birth to countless musicians. "To see it turned into some retail outlet would be like beating the small heart of the Oxford music scene to a pulp with a premade sandwich. Terribly sad." Jack Bevan from Foals said: "The Cellar was one of the places where it all began for us.... keep it open." He called the news "terrible". Mark Gardener from Ride said he was "very sad to hear about the proposed closure" and asked people to sign the petition. The organisers of Truck Festival, based in nearby Steventon, said: "So sad to hear The Cellar, a vital pillar in the Oxford music scene, is under threat." Rupert Sheppard, clerk for the charity, said it had "no wish to cause unnecessary upset to those who value The Cellar".